A look at the chiller display and we do see some familiar pieces which we’d tried on our previous trip. The piece in rouge above is a remake of “皇冠” which we had the other time. Easier to handle a piped ring than to prepare a mousse dome that has to be frozen to set I guess. 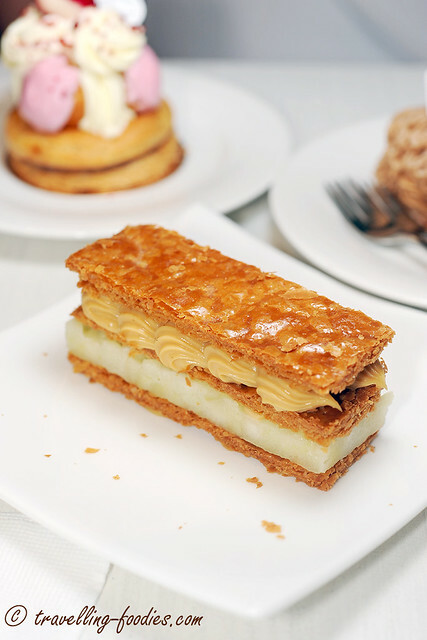 And the piece which we are here to try… their signature Caramel and Apple Mille-Feuille… made to order and limited to a certain number per day. We’d missed this the last time and we made sure we ain’t gonna miss it this time round. Sandwiched between three layers of baked and caramelised puff pastry lies a layer of frozen apple gelée at the bottom and caramel-flavoured crème pâtissière on the upper deck. Puff pastry layers were very well made and this is only to be expected. What I’m most glad is how they are prepared only upon request to ensure that the puff pastry remains crisp and fresh upon serving. Crisp and fresh they most certain were. 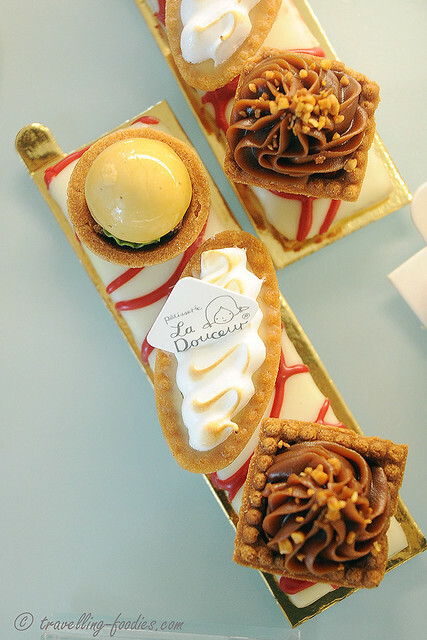 Its paying attention to details like this that distinguishes Pâtisserie La Douceur from other run-in-the-mill pastry joints around. The caramelisation on the puff pastry lends a slight hint of bitterness and that bore lovely contrast with the sweetness from the caramel-flavoured creme patisserie and the tart flavours from the apple gelée. The juxtaposition of layers of hot pastry against the cold cream and gelée was also quite mind-blowing upon the first bite. So it must be eaten immediately upon serving to get that full spectrum of gastronomic experience before everything finally reaches thermal equilibrium. Very well made piece. Next we had is a sampling of their Crème Brûlée. 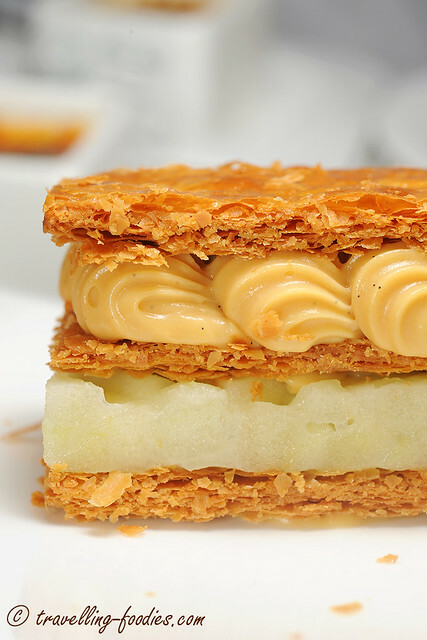 The experience was equally mind-blowing, if not even more compared to the caramel-apple mille-feuille. Intensely custardy and rich, the small little square ramekins are packed with so much vanilla and eggy goodness! Like the caramel-apple mille-feuille, the caramelisation of the sugar topping is done upon order. So the silky textures from the custard are matched by the crunch from the thick shards of slightly burnt sugar which had been freshly assembled, thus alluding wafts of caramelised aroma . Very good indeed! 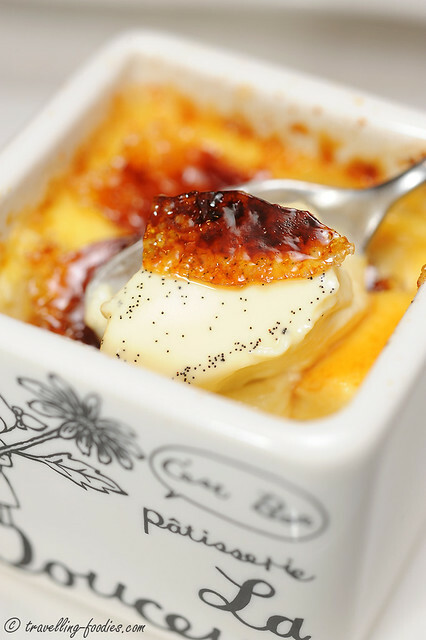 The density of the vanilla seeds with every spoonful speaks of generosity, sincerity and a deep desire to get their creme brulee right. Each piece goes for NT135 to dine-in and NT 165 for a takeaway. I opted to have mine as a “takeaway” but had them as “dine ins” as I want to keep the ramekins as a momento and yet wanting to enjoy the full flavours of the freshly bruleed pieces. Upon finishing, the waiting staff would promptly collect the ramekins from you, wash them and have them properly packaged for you to take away. The best of both worlds quite literally. 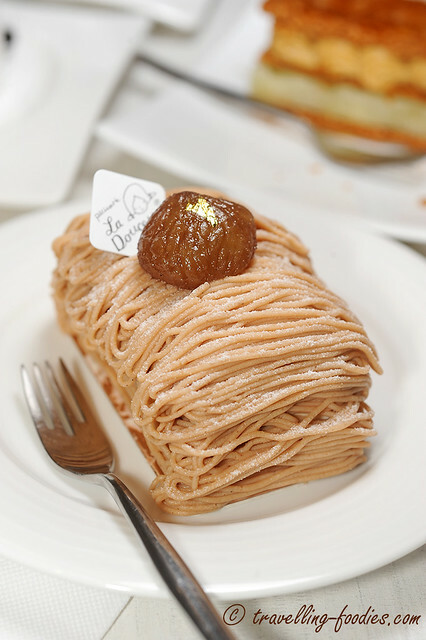 Then there is Mont Blanc, yet another classic yes… you had been warned. 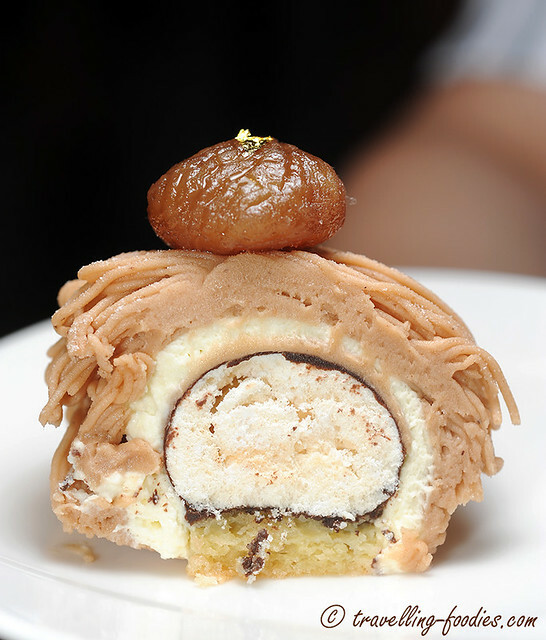 The interior consists of a cylindrical piece of baked meringue coated with chocolate and sitting on a piece of dacquoise. This is then wrapped with a layer of rum-infused creme chantilly before having thin vermicelli-like strands of mousse à la crème de marron piped all over. The whole piece is then customarily embellished with a single marron glacé and a small fleck of gold leaf. A cross-sectional view of what the innards look like. For me, the sugary sweetness is overplayed with too big a piece of meringue as the core. Yes it lends a wonderful crunch but the overall palate sensation was more jarring than anything else. It watered down the otherwise crucial flavours from rum and chestnuts. A little tip off the scale if you ask me but I suppose it is good for one who is in hope for a sugar rush. Not me unfortunately. 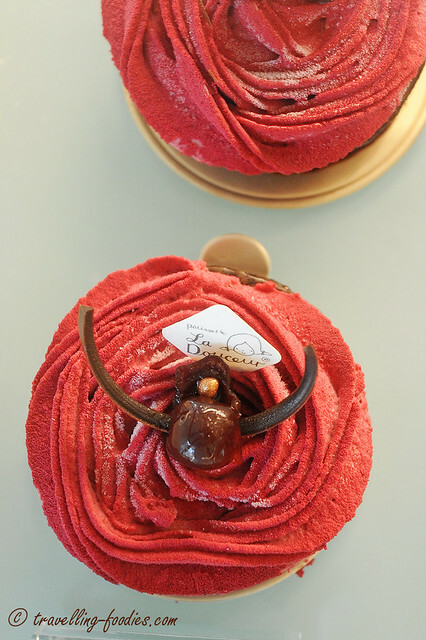 A St. Honore which was supposedly raspberry themed but most unfortunately, we didn’t get any of that. The choux pastry is no longer crisp but that is usually the case with many choux-related pastries and hence not totally unexpected. 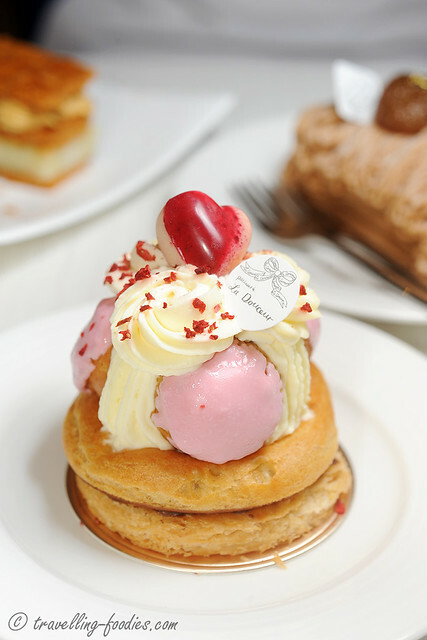 The whipped cream which went around and between the balls of choux buns were bland bland bland… quite shocking really, considering how good the creme patisserie for the mille-feuille was. 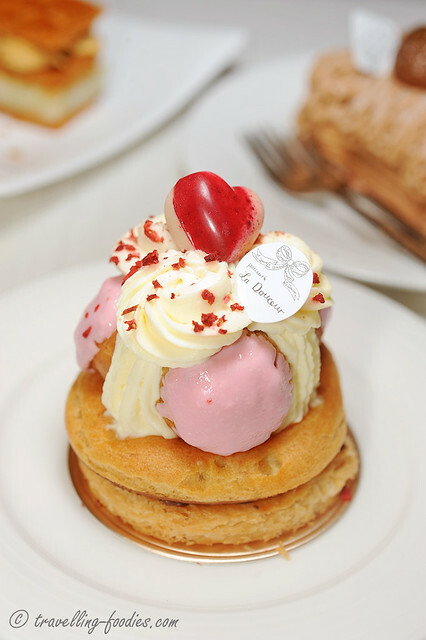 This piece is easily the weakest link amongst all the pieces which we’d tried in Pâtisserie La Douceur and thus sorry to say but we would not be trying this piece again nor would we recommend anyone else do so. But do visit them to try the other pieces from their range, which can be quite extensive. 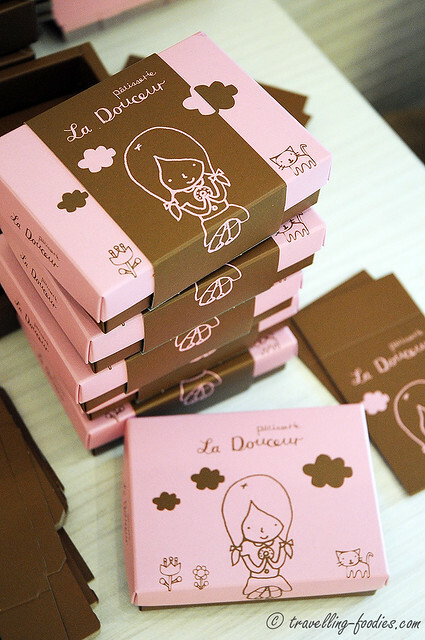 5-6 creations are easily available everyday and the range increases over the weekends, not forgetting their selection of macarons as well which we’d not been able to try. Well, there is always a next time. 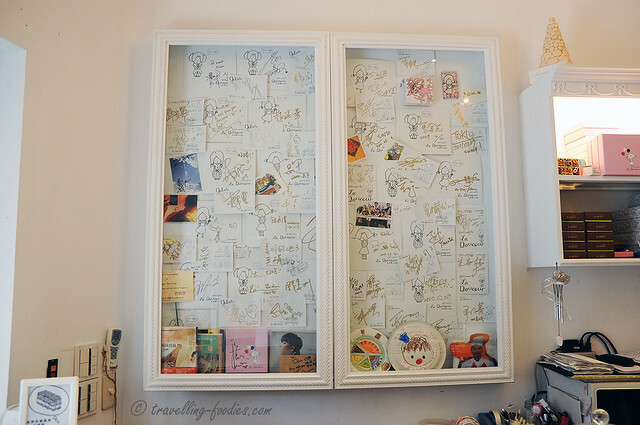 This entry was posted on July 4, 2013 by Alan (travellingfoodies). 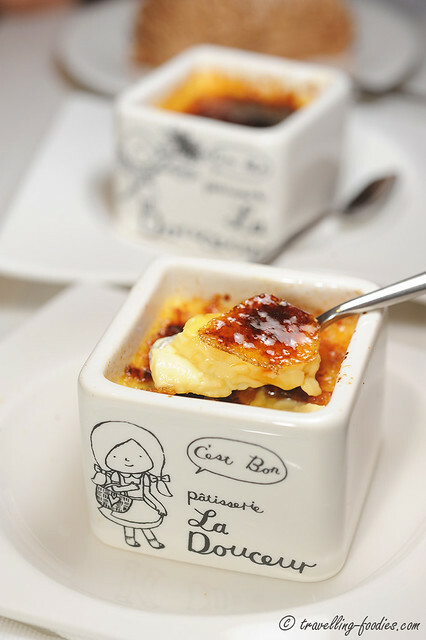 It was filed under Food, Travel and was tagged with caramelised, chestnut, choux pastry, creme brulee, creme chantilly, dessert, french pastry, Marron Glacé, mille-feuille, mont blanc, saint honore, sweet, Taipei. wow! u get to travel quite a bit in a year hey? lucky u! 🙂 the mille feuille the creme brulee looks soooooo delish (esp so cos the close up of the vanilla specks in the creme brulee). 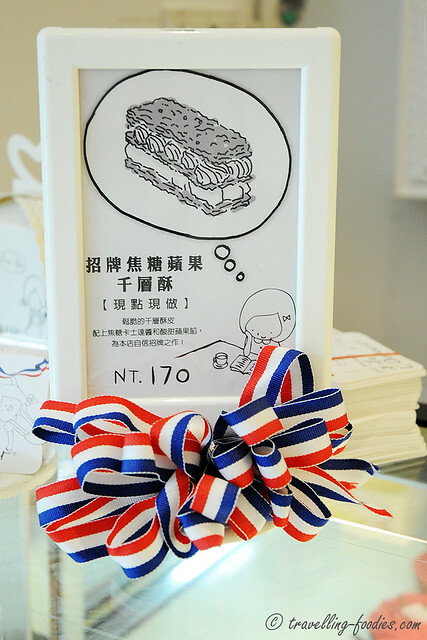 i wish i have the chance to revisit taipei again too – will def pay them (plus sadaharu of course) a visit. heh. yeah… 3 old places within a span of a 1-2 months from each other. Quite hectic but fun at the same time!